We couldn’t have chickens when we lived in Bloomington, but that didn’t stop me from researching the notion and then subsequently mourning the gaping hole in my life that only a small flock of chickens could fill. So, needless to say, once we moved to the country, starting a coop was one of the first things on my to-do list. Audra has resisted the idea for years now. And honestly, she seemed hesitant until just a week or so ago. It if hadn’t been for a timely and well-written article on keeping chickens in the very fine quarterly publication Taproot this month, I might not have been able to get her on my team. But she relented, and then offered me her undying support like we ultimately tend to do for one another. When I walked into the local farm store, I immediately saw the little chick hutches just inside the door. There was already a family getting a dozen or so chicks. 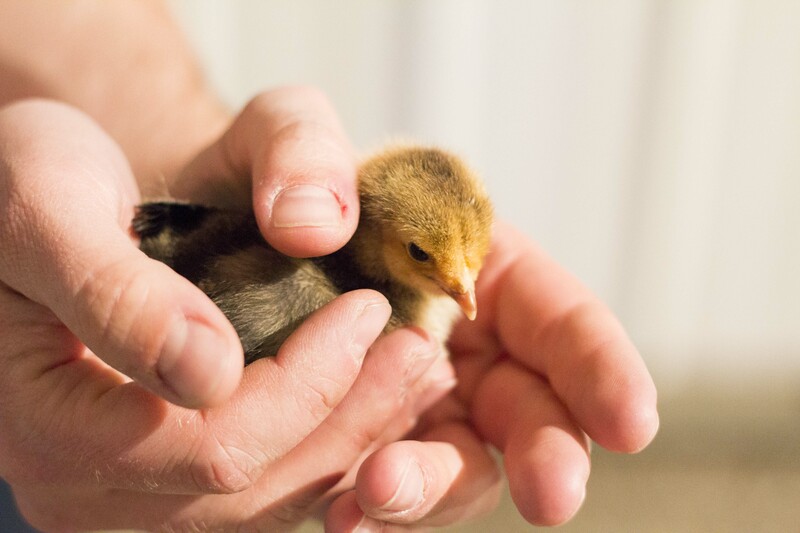 It seemed to be a grandma and grandpa buying chicks for their grandkids, in the hopes of teaching them some responsibility and a love for animals and to give them a reason to get their grandkids over to their house as often as possible. The grandma had her camera out and was taking pictures of the staff corralling their chicks and her grandkids climbing around on the bags of feed and bedding in their cart. It was a cute moment, but the truth was that they were just in my way. I mean, my god, I’ve only been thinking about this for ten years, people. I had the sudden urge to knock down the little girl and tell her that this was MY TIME and she needed to just get over herself, but I held back the urge and tried to stay out of their special pictures until they got the hell out of my way. And then the staff boxed up my ten Barred Rock and five Buff Orpington chicks and I set them on top of my own pile of brand-new chicken keeper paraphernalia and the moment passed without much consequence. After a $100 bill and the short walk to the truck, my decade-long goal had been completed, or at least started. In high school I was active in the FFA, eventually earning my State Degree, which at the time was a pretty big deal for me. My first SAE (Supervised Agriculture Experience) was raising pheasants. After a couple years of using a corner of the garage as a temporary brooder, we decided to make a stand-alone brooder, mostly so that the entire house didn’t smell like manure all the time. The thing was pretty huge actually. Probably way over-built for the fifty or so pheasants that I got each year, but it was sturdy and well-designed and did exactly what we needed it to do. By junior year I had started to focus more on raising heifers and trying to date girls, so the pheasant production stopped. The aluminum-sided brooder has sat there for over fifteen years, just waiting for its resurrection. It’s now in my machine shed (which I know my parents are pretty excited about), with a new plywood floor thanks to some help on the table saw from my mother-in-law. As Audra and I brought our son out to help put the chicks into their new home, I was hit with that hard-to-explain smell of young chicks and chicken feed and was reminded of those days so long ago when my own parents helped provide me with the trust and resources to allow me to put my own birds into this little hut. My own kid got distracted pretty quickly and failed to appreciate my effort to give him the perfect childhood on the farm, but Audra was immediately enamored with these little chicks. She delicately placed each one into the brooder and then just sat and watched them warm up under the light, and then eventually find their feed. “I’m like oddly excited about having chickens,” she says to me, with her head still in the brooder and her heart on her sleeve. That’s us. Oddly excited. Strangely thrilled. And probably, to some extent, hopelessly naïve.